From the Author: These manual therapy techniques will transform the way you perform bodywork. Unlike many other massage therapist books, this training manual will be extremely useful for continuing education for both new practitioners and advanced therapists working in myofascial release, structural integration, Rolfing ® physical therapy, and other forms of bodywork. With over 225 pages, more than 250 photographs and over 50 detailed anatomy illustrations, this in-depth book clearly illustrates hundreds of effective therapeutic myofascial release techniques. 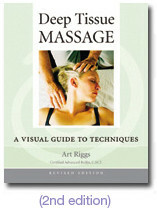 My Thoughts: This is one of the best massage books I have ever read...and read again...and read again. It is probably more than many of you need and is written for vocational massage therapists, but he just does such a good job with the philosphy and theory of touch in addition to explaining so many good techinques as well.